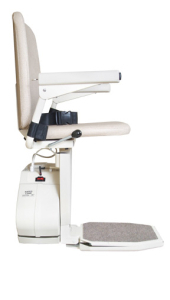 Stair lifts are easy to use, install, and maintain. It is for this reason they are popular aids in homes where a resident cannot manage stairs on his or her own. Due to the accessibility delivered by stair lifts, many business and corporate offices are also looking to install stair lifts in their buildings. As easy as it is to install a residential stair lift, the same is not true when installing in a commercial building. Here a few of the difference and how a stair lift for commercial purposes must be designed a bit differently. Commercial Codes – When installed in a public place, stair lifts must adhere to certain building, design, and usage codes that vary from state to state. Some states require that chair lifts be ADA code compliant while others do not. Other states may require that ASME code be met, as well. Most states ask that commercial stair lifts be inspected by a licensed inspector upon installation and then re-inspected every year after that. Aside from these codes, there are a few design qualities that every commercial-grade stair lift must meet. Safety – The safety regulations of stair lift used in a commercial building is enforced while residential stair lift safety is not. The reason is, a greater number of people use stair lifts in commercial buildings, meaning that the lift must be able to stand up to the wear and tear of high usage. All commercial bound stair lifts must have smooth start and stop features, chair stopping sensors in front and behind the chair, locking features to prevent unauthorized riders, breaking systems, and a seat belt. Proper safety features will prevent accidents and injury as well as protect the company from lawsuits. Space Requirements – Before the install of a commercial chair lift, fire safety codes should be considered. The fire department holds the right to remove any and all equipment that interferes with safe evacuation of all persons in the building. All commercial stair lifts should be close enough to the railing or wall so as not to prevent other persons from ascending or descending the stairs. This is especially important during an emergency or evacuation.